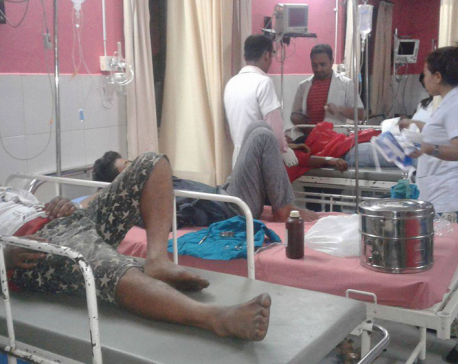 BIRATNAGAR, Aug 15: Altogether 26 students of Shree Secondary School of Letang-6, Morang have fallen ill Tuesday after drinking water from the school’s water tank, which was poisoned with pesticide. District Police Office, Morang has informed that the condition of four students is serious. The age of the students who fell ill ranges from six to 19 years. The four are being treated at the Nobel Medical College, Biratnagar. Police have informed that the rest of the students who were affected by the poisoned water are receiving treatment at the Primary Health Center, Mangalbare. According to Chief of District Police of Morang Manoj KC, police have already started an investigation into the incident. The bottle of a pesticide named “Siperin 10” was found in the water tank. The school has a concrete water tank on the first floor and the tank’s lid is open most of the time and anyone can access it. Police said that someone might have poured the pesticide in the water tank. The students fell ill immediately after drinking the water on Tuesday. Some of the students started vomiting after drinking the water while others complained of headache and burning sensation in the stomach. At around 11 am, some of the students had also complained to the school principal about a strange smell in the water. Inspector Yog Raj Khatiwada of Area Police Office Lotang informed that some of the 26 hospitalized students have already returned home. Khatiwada added that Kamala Limbu, Manish Thapa, Khuwbu Mishra and Shristi Niraula were the four students who were referred to Nobel Medical College for further treatment. The school runs classes for students of grade one to 12.